Don't Kiss Your Pet Rats! Sure, dress up your rodents; just don't kiss them! 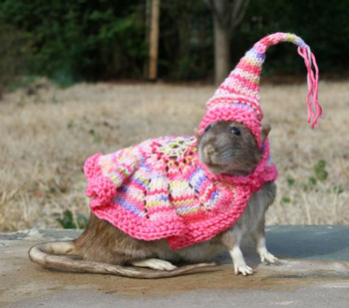 : image by Patti Haskins via gothamist.comIt's one thing to dress up your pet rat, even hand knit his clothing... But it's quite another thing to kiss and cuddle him. Just ask the Australian woman who nearly died of rat bite fever... and her rat never even bit her! Last year this young woman was admitted to the hospital with streptobacillus moniiliformis, a potentially deadly strain of bacteria that is usually transmitted by animal saliva or feces. Though she appeared at the emergency room of the Royal Adelaide Hospital with high fever and a severe headache, the woman eventually developed pneumonitis and meningitis and had to remain in the hospital for 17 days. The attending physician and co-author of an article about the occurrence in the Medical Journal of Australia, Dr.Narin Bak, noted that s. moniliformus infection is a disease associated with areas of poor hygiene such as slums and poor neighborhoods. Now, however, as pet rodents have become more popular pets, cases of s. moniliformus are more frequent among pet store owners and pet rodent owners who get too cozy with their pets. As in the case of the unnamed patient documented in his article, a bite does not have to be present for the infection to occur. This bacteria can be acquired from a rodent's saliva or feces, neither of which should be handled.